It also means that I have some questions for you. First: which cover do you like best? These are all covers that I created using Canva’s free templates and design elements (I’m hoping that future Billfold books will feature original art, but since one of the goals of this book is to earn money to produce the next book, I’m going with free art this time), and each of them has a slightly different feel. I have my favorite, and I’m curious if it matches yours. The audiobook wasn’t something I was seriously considering until I got my new MacBook and the newest version of GarageBand and discovered that I could create profesh-quality audio without having to do any additional work on my end (compressing, normalizing, etc.). 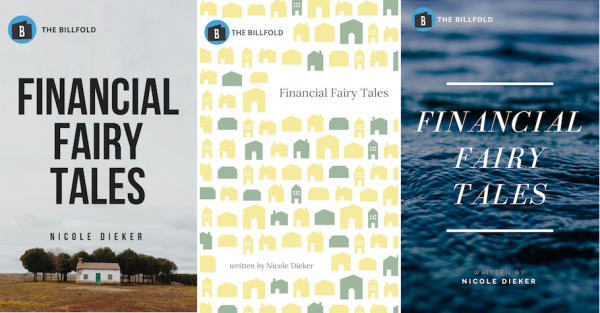 But I launched the newest season of the Writing & Money podcast last week, and the audio sounded so good that I asked myself: how long would it take to read Financial Fairy Tales aloud? I realize I am making the argument that I should release this book in EVERY SINGLE FORMAT, so I’ll step aside and let you argue for ONLY THE FORMATS YOU WANT. Also, let me know which cover you like best.